Now's a good time to buy some used Electronic Arts games, or dust off the ones you already own. EA has confirmed to Game Informer that it's discontinuing Online Pass not only for new games, but for existing games as well. The much-maligned program required players to enter a voucher code to access certain features of EA games, mainly online multiplayer games. Games purchased as new included a free pass, but additional passes cost $10 to $15. The program was meant to squeeze more revenue from the used game market, but EA acknowledged this month that "many players didn't respond to the format." 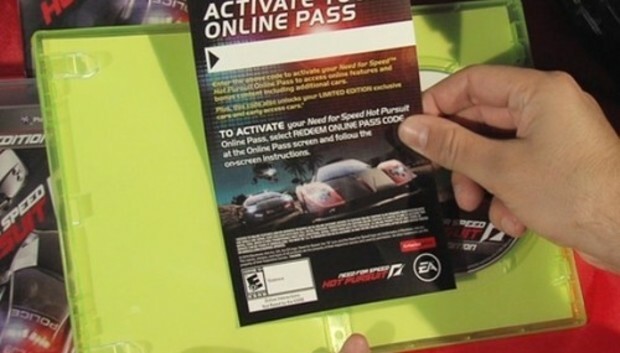 Online Pass wasn't just an obstacle for used game buyers; it was also a hurdle for paying customers, prone to technical problems such as expired codes and server shutdowns. "As we discontinue Online Pass for our new EA titles, we are also in the process of eliminating it from all our existing EA titles as well," EA told Game Informer. "We heard the feedback from players and decided to do away with Online Pass altogether." EA says the elimination of Online Pass will take effect over the next several weeks. Most games will still require a pass that can be redeemed for free, but some EA Sports titles will ditch the Online Pass prompt entirely. By eliminating Online Pass, EA may be trying to restore some goodwill, after being dubbed Consumerist's Worst Company in America for two years in a row, and sparking controversy over always-online DRM in Sim City. But the more cynical view is that programs like Online Pass may be rendered moot by the upcoming Xbox One and Playstation 4, which may come with new restrictions on used, borrowed, and rented games. Neither Sony nor Microsoft have explained their policies in detail yet, but it's clear that change is afoot as they try to migrate from packaged discs to digital sales.